Lou Corona, commonly known as the “Healthiest Man in the World” is a Holistic Health Educator who travels all over the world assisting people on the path back to health and wellness. He teaches the four principles that are key to this process and how to live clean, lean and serene with an abundance of energy. He teaches cleansing, detoxing, enzyme/probiotic therapy, How to practice a raw living food lifestyle and how to prepare living foods that are good for your body. Puradyme is Lou’s company offering only the highest quality enzymes, probiotics and super-foods in the world. In this blog, I’m gonna share with you his teachings that I learned years ago from Lou; he calls them the four principles of life. When I first met Lou he was giving a talk to a group of people about his story at the Au Lac Restaurant in Orange County. He told us that he was in the Air Force when he was in his early 20’s and ate the cafeteria food that was available to him. He went through boot camp with flying colors and at that time he was able to do 90 pull ups, he could do 250 push-ups, he could run a mile in 41/2 minutes, he could do 4 minutes underwater, he could climb a twenty-foot rope in six seconds. But after Boot Camp, his body was having trouble digesting the food he was eating, and he started getting constipated. He said he was going #2 every other day and then every three days. Eventually, it turned into once every week and then once every two weeks, and then once every three weeks. He woke up with cramps, and pain and there were many times he tried to go but couldn’t. He started developing acne and pimples all over his face. At 21 years old he made an appointment for surgery to have his tumor removed. When he was waiting in line at the hospital for his medication, he felt somebody walking to the side of him, and he looked to see who it was and there was no one there. Then he heard a whisper and was told to walk away and he will be taught everything he needs to know to heal. He walked away from surgery and he received the four principles. Soon after, Lou met a man who looked to be about 30 years of age and then later found out he was 52. This man traveled the world for thirty years learning natural healing, herbs, pressure points, etc. He brought Lou some herbs, cut them all up, and put him in a big bowl.”Eat it” the man said. Lou said, “you’re kidding me, that’s for animals, that’s not for humans.” (The most raw greens Lou ever had before was iceberg lettuce.) But Lou told him previously that he wanted to do whatever it takes to get healthy. The man told him he needed to start by eating this and only this for the next two months so he can heal, cleanse and restore and balance every cell in his body. Within a week of eating these bitter herbs with water every day, Lou began to like it and his taste buds began to adapt to them. He started going to the bathroom better, He was breathing better and then six months later the tumor was completely gone. He told his family what had happened but they all rejected what he was saying. No one believed him. So he left California and went silent, and lived off of the land up in Washington State. His hair just kept growing and growing down to his waist. He even had a garden orchard. Everything was going great and he really appreciated every minute of every day. His mentor then taught him how to use breathing techniques to achieve great feats of athleticism. After many years he was led to fully embrace the teachings of his mentor and teach the Four Principles that he received to the world. 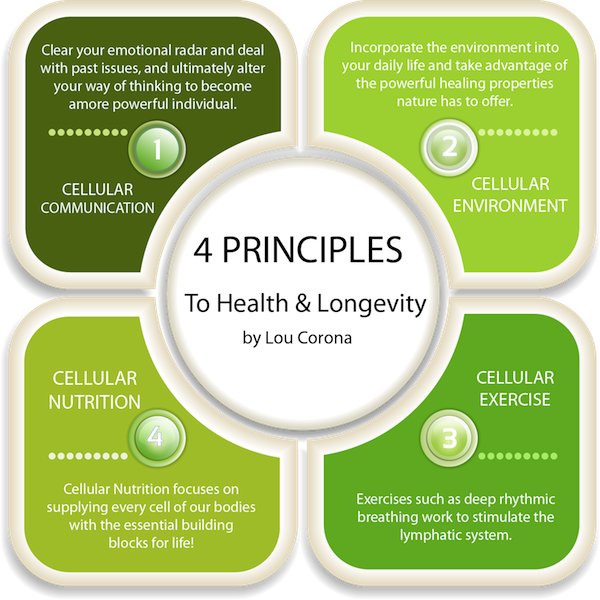 Now, hundreds of thousands of people have benefited from these Four Principles and I’ve personally seen it help many people get well and heal from disease. By now you must be curious about what these Four Principles are and how to apply them to your life. If you haven’t watched Lou’s 1-hour webinar presentation already, I urge you to take some time out of your day and check it out. By watching this video it will only jump-start you to feeling 100% educated as well as empowered. Lou covers a wide range of subjects on toxemia and the root causes. Watch Video. Lou suggests that after you finish the webinar go to the website and learn more about how to get started cleaning up your body and your life. 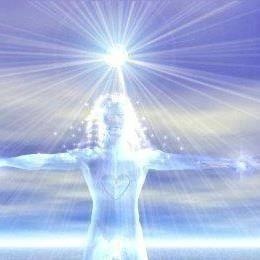 Cellular Communication is where we have OPTIMAL MIND/BODY SPIRIT COMMUNICATION. Communication is considered OPTIMAL when the energy that naturally runs freely throughout our body, mind and spirit is unencumbered by negative thoughts, emotions (Fear, Anger, Jealousy, Shame etc) and toxins, thus allowing heightened communication between all the cells in the body! There are two kinds of exercise- External or Non-Cellular Exercise used for building muscle (Weightlifting, Calisthenics, Bicycling, Running), and exercise that is Internal or Cellular Exercise that gets into the cells and actually oscillates or moves or exercises them. Cellular Exercise is an extremely important form of exercise that detoxifies the cells of the toxins that have gotten stored in them and also energizes the cells. Cellular Nutrition is grounded in supplying every cell of our bodies with amino acids, fatty acids, glucose, simple/ complex sugars, vitamins, minerals, trace minerals and phytonutrients on a daily basis! This creates a radiant, healthy, and joyful life mentally, emotionally and physically!